Good Morning all, welcome to a new Merry Monday Christmas Card Challenge. 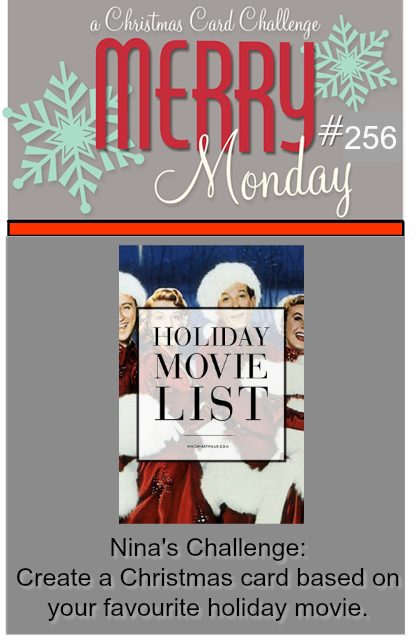 I am your hostess this week, my inspiration for this challenge is to Create a Christmas card based on your favorite holiday movie. The Grinch is not actually one of my favorite movies but it is my husbands. I love the old style movies Rudolph (1964), Frosty the Snowman(1969) and Santa Claus Is Comin’ To Town! (1970). I grew up in a pretty small town in the interior of BC and we had two TV channels and come the holiday season these wonderful animated movies played every year. I think they still do and I still end of watching at least parts of them. Anyhoo, the Grinch won the lottery for the card though and this is what I came up with. I found this fun image on Pinterest, the sentiment is also from the interwebs as I don't think the movie lines are any big secret :). I added some snowy texture to the background then added some foam tape to the back of the sentiment. I finished with some twine. Supplies: White and red cardstock, Image and Sentiment - Pinterest, twine. Our all-star line up of designers, guest and regular is stellar so make sure you stop by the Merry Monday blog to see all the wonderful cards that are always an inspiration. We would love for you to play along. 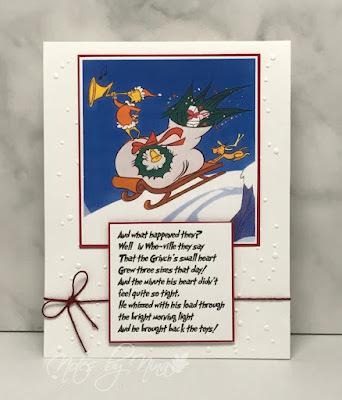 Love the fun image you used Nina, beautiful Christmas card for your challenge. What a fabulous challenge, Nina - I really enjoyed it! What a darling inspiration card you created! I love the Grinch too and your added snowy texture!! Great card Nina. Really like the added snowy texture in the background. Oh....this is just too darn cute! Love that movie! Great challenge Nina. Your card is fantastic. Hope you have a great week. I love how you incorporated the quote onto the card! Great job! I love this Nina! I love the newer version of the Grinch (one of my favourites!). We had two channels growing up too! Fab card. Love that image against the snowy texture. Pure cuteness Nina! What a great image to create a card with! So fun and festive! Thanks for the inspiration! Such a cute image on your fun card Nina.